Our stylish cruises through the spectacular Islands of Greece are unforgettable journeys of exploration and discovery, the experience of a lifetime. If what you are looking for is a holiday that offers both delightful relaxation and stimulating fascination, discovering the ancient sites and the welcoming harbours of Greece, then our gulet cruises in Greece will be perfect for you. A wide range of gulets are available for travel in Greek waters, but we select the vessels used on our tours most carefully. Only boats that meet our high standards regarding comfort, technological quality and service levels are used on Peter Sommer Travels’ cruises. Based on those standards, we can provide our guests with the high quality experience that they deserve. The experience of a boat tour always relies on the quality of the crew and the service they provide. That is why we always work with captains of great experience and chefs of great skill, performing at their best to make our tours a perfect experience from beginning to end. We enjoy our on-board meals in a variety of panoramic settings, from remote coves via serene old fishing villages to lively and picturesque island ports. The shipboard meals are always freshly prepared on board by our chefs in the gulet’s galley, where they create a great variety of excellent meals every day. They are complemented by the variety of local specialities we enjoy in selected restaurants ashore. 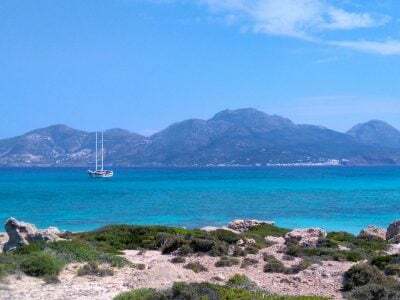 Cruising through the Greek islands is a wonderfully adventurous experience that has a subtly different feel to our voyages along the Turkish or Italian coasts. Surrounded by the wide open sea, hopping from island to island, the horizon dotted with enigmatic rocky outcrops, confers a feeling of bold exploration, enhanced by the ambience of the islands themselves. Usually relatively, small, sparsely inhabited and wonderfully diverse in flora, fauna, local traditions, architecture and archaeology, each island is a small world unto itself. The Greek islands and the Aegean Sea are a fascinating area to explore, not least because of the region’s long and complex maritime history. The Aegean has been a cultural crossroads and melting pot since the beginning of human presence. Over the millennia, many peoples have travelled these waters and settled the islands, from the first Palaeolithic seafarers, via Neolithic farming communities, Bronze Age traders, Greek colonists and Roman exiles to Byzantine monks, Venetian adventurers and Ottoman pirates. 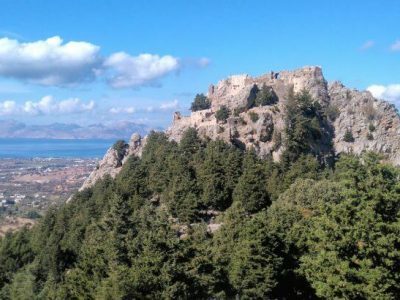 On our cruises, the larger islands such as Samos, Kos and Rhodes, famous for their imposing Crusader castles and enormous ancient temples, are juxtaposed with the smaller islands that provide a more intimate view of traditional Greek island life, with their picturesque harbours, winding streets, small town squares, simple family-run tavernas and beautiful domestic architecture. Steeped in history, these islands are also blessed with natural beauty – from volcanic landscapes to coastlines bathed in sea sparkle – and provide a fascinating journey through Greece’s past and present. We offer a variety of 1 and 2-week scheduled gulet cruises in Greece, through the beautiful Dodecanese Islands from Samos in the north to Rhodes in the south, or through the celebrated Cyclades including gorgeous Santorini. Along the way you’ll visit some of the most beautiful and fascinating archaeological sites of the region, such as Patmos, with its magnificent Byzantine monastery; Bronze Age Akrotiri, the Pompeii of the Aegean; and Rhodes, with its impressive Crusader fortifications. 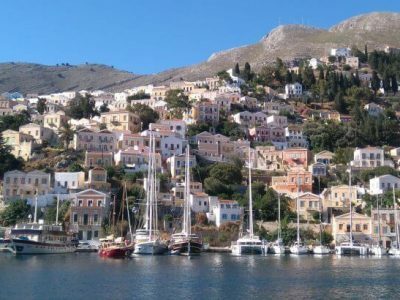 You will also have the opportunity to explore some less-frequented off-the-beaten-track islands, such as the small volcanic island of Nisyros, rugged Kalymnos or Pserimos, which has less than a hundred – very friendly – inhabitants. Our cruises combine the joy of travelling through the best of the region’s maritime and landlocked scenery with that of visiting a selection of archaeological and historical sites that includes the most famous must-sees as well as less well-known ones that are of equal charm and interest. You will also have the opportunity to explore pretty harbour towns and picturesque villages and get a real feel for the individual character of island along your route. The word ‘gulet’ (Turkish gulet – also gulette or gullet) appears to come from the French goulette, meaning a schooner. These double-masted wooden boats, originally made from varieties of local pine, have a long history as transport and fishing vessels in the Aegean and along the southern coasts of Turkey. On our gulet cruises, we use a selection of the best-built and most carefully equipped such yachts available in the region. They are hand-crafted of mahogany, pine and teak, according to a design that was developed for these waters already in Byzantine times, with a striking sharp bow, a broad beam and a rounded aft. Their style, elegance and grace, their comfortable ambient and individualistic character sets them apart from standard industrial yachts. While aboard our gulet cruises in Greece, you are certain to enjoy glorious swims in the clear blue waters of the Aegean, to admire the wonderful and varied scenery of the Greek Islands and to savour the delicious range of meals prepared by your chef in his well-stocked galley. For those long, leisurely and relaxed warm days of travelling, a selection of Greek wines is kept in stock, as are spirits, beers, soft drinks and fruit juices. Beyond the sheer pleasure of being aboard, our guests can engage in a variety of activities, among them swimming, snorkelling and kayaking, and of course the range of land excursions to the beautiful villages and fascinating archaeological sites, for those eager to explore the history and local culture of Greece. Our guides, who are true connoisseurs of the areas we travel, will introduce you to the finest and most authentic local cuisine: our cruises in Greece include a range of shore meals at carefully selected venues in towns and villages, ranging from traditional family-run tavernas to more sophisticated restaurants that have transformed the local culinary tradition into true gastronomic highlights. On most of our cruises, about three to four hours per day are spent travelling leisurely along the shore or between islands. We mostly travel by motor, to make sure we reach our various destinations, but time and conditions permitting, we occasionally have the glorious opportunity to travel under sail! We have been organizing scheduled tours through the Dodecanese and Cyclades islands for many years, and the combination of relaxing on-board travel, swimming in the beautiful waters of the Aegean, sampling delicious food on and off the gulet, and of course the thrill of our archaeological adventures on diverse and fascinating islands, makes them a perfect destination for private charters. Even for a group with diverse ages, interests or likes, the islands have something to offer to everyone. The Greek gulet cruise calendar runs from spring until autumn – for more specific dates, please take a look at our schedule of trips below. If you have any questions about any of our Greek gulet cruises or you’d like to enquire about creating a bespoke gulet holiday in Greece just for you please don’t hesitate to get in touch. We will be delighted to help. 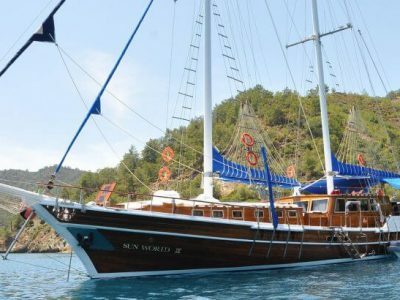 Average rating 5 out of 5 from 372 reviews for Gulet Cruises in Greece, according to AITO reviews. Excellent. A fortnight on a gulet with 16 passengers and two archaeologists, exploring ancient Greek sites. 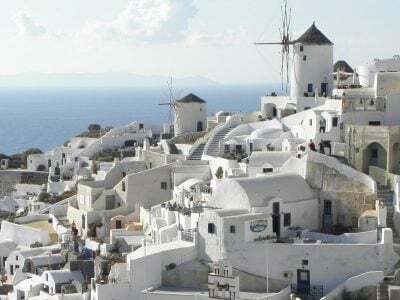 But more, walking through centuries old Greek villages, eating ashore as well as on board so we tasted food from different islands, swimming in the clear warm water of the Aegean, learning about the history of a country whose philosophy and literature have been such a huge part of our own culture. This was our third trip with Peter Sommer Travels and we are planning another. What more can I say? Excellent. A well respected operator that works hard to provide a unique travel experience for those interested in delving deeper into a country's culture and history when travelling.